A delightful little Christmas Mouse made from the finest lambswool and personalised with your chosen initial hand stitched onto his tummy. Sporting a tiny scarf and a little hand stitched gold nose, this Mouse makes the ideal stocking filler. He will sit happily on a table, poke his little nose out of your pocket or hang by his tail from the Christmas tree. You'll find a box below to enter your choice of initial. 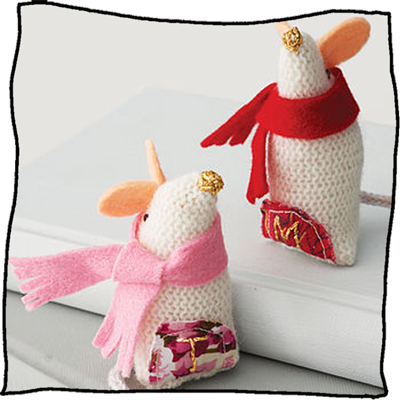 Below that you can choose the colour of your Mouse’s scarf and the vintage fabrics on his tummy. Christmas Mouse comes beautifully packaged in a gift box or bag. Dimensions: Each mouse is approx. 9cms tall.